How about a picnic in the countryside while still enjoying sweeping views of Venice and the lagoon? The bread-basket of the lagoon, Sant'Erasmo is the largest of the Venetian Islands and the home of many fruit and vegetable varieties native only to the lagoon. 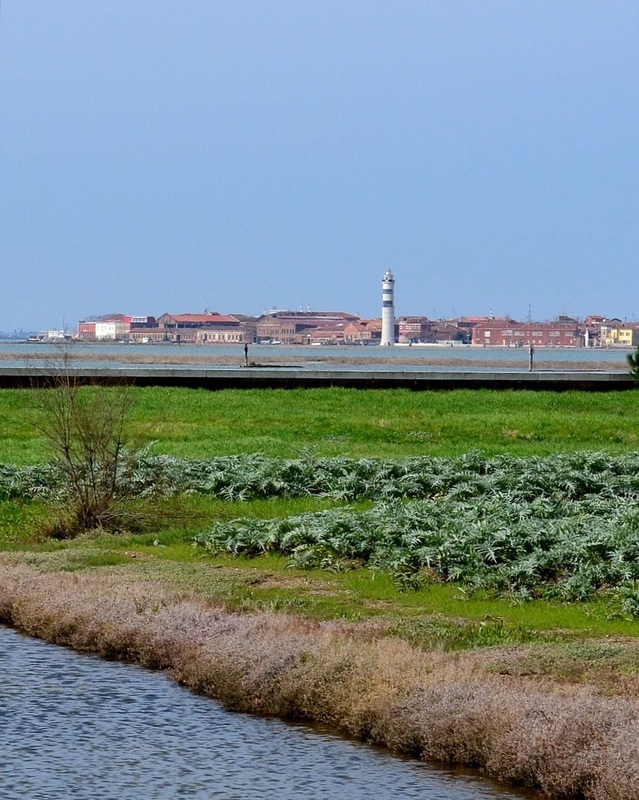 (This, for example, is where Venice' famous violet artichokes come from.) The island is mostly covered in lush farmland and is surrounded by beaches and marinas. On Sant'Erasmo you'll discover organic farms, a small rural osteria and one of Venice' only operational vineyards. It's also possible to rent bicycles and/or kayaks for exploring on and around the island. Get There: To get to Sant'Erasmo, take the vaporetto number 13 from the Fondamenta Nuove stop on Venice. The three stops on Sant'Erasmo are Capannone, Chiesa, and Punta Vela. Your travel time will range between 35 and 50 minutes depending on where you decide to get off of the boat. Would you like to get a closer look at this island? See Venice Italy offers an "Island Farms & Wine Tour" on the Island of Sant'Erasmo that includes a visit to an organic island farm, lunch of local produce and a drink at the vineyard! 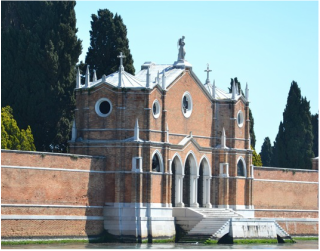 San Michele, the cemetery island of Venice, breathes as much or more history and mystery as any monument in the center of the city, yet it is also an oasis of peace and quiet only five minutes by boat from the bustling Fondamenta Nove. Here you can visit the first renaissance church constructed in Venice, the Church of San Michele built in 1469 and also discover the tombs of many notable people including Joseph Brodsky, Igor Stravinsky, Emilio Vedova and Ezra Pound. However, you may find yourself more enchanted by the gorgeous mausoleums of the Venetian families or by the many mysterious graves that note a date of birth but none of death. Still in use today, San Michele Island has been the main cemetery of Venice since 1836 when the two Islands, San Cristoforo and San Michele, were joined together following the French decree that it was unsanitary to bury the dead in the center of Venice and other islands of the lagoon. How to get there: San Michele can be quickly and easily reached via the number 41 or 42 public boats from Fondamenta Nove in the direction of Murano. San Michele is the first stop on those lines. Murano Glass work is the most famous and historic of the Venetian arts. 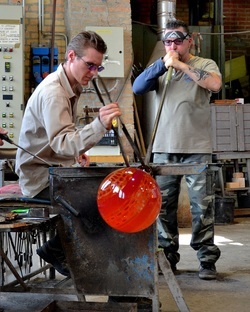 For more than 800 years, the Murano glass masters have practiced their craft on the island of Murano. During those years they have invented and perfected many, now globally famous, techniques of coloring, sculpting and decorating glass. Today, Murano is still the epicenter of glass arts in Venice, and still inhabited by descendants of the master craftsmen whose work made glass arts famous through the western world. There is an incredible amount to see, do and learn on their island! We highly recommend visiting the island of Murano during your stay in Venice. But, we also recommend planning your visit in advance! Read the Murano Glass section of our blog and check our Murano Glass & Sculpture section for some ideas of the best places to visit. Collectors and those with a serious interest in Murano glass can also book private "Inside Murano Glass" tours with See Venice Italy. Get There: Murano can be reached in 15 minutes by boat from Fontamenta Nuove, or 30 minutes from San Zaccaria. The lace-makers island of Burano is about a 40 minute boat ride from Venice and well worth the trip. In addition to the traditional lace, still made and sold on the island, Burano offers a tiny universe of brightly colored houses and some wonderful seafood restaurants. Head for Burano in the morning, get off one stop early on the Island of Mazzorbo and walk to Burano, stay for leisurely lunch and then enjoy the breezes and views of the lagoon on your way back into town. How to Get There: Burano is located in the north east side of the lagoon near the islands of Murano and Torcello. You can get to Burano via the number 12 public boat from Fondamenta Nuove. Though now sparsely populated, the island of Torcello is actually the oldest settlement in the Venetian Lagoon. It was the first place that settlers from the main land fled to after the barbarian invasions and was once also the most densely populated part of the lagoon. The most important landmark on the Island is the Cathedral of Santa Maria Assunta, founded in 639, where to this day you can see some of the oldest mosaic work in Venice. 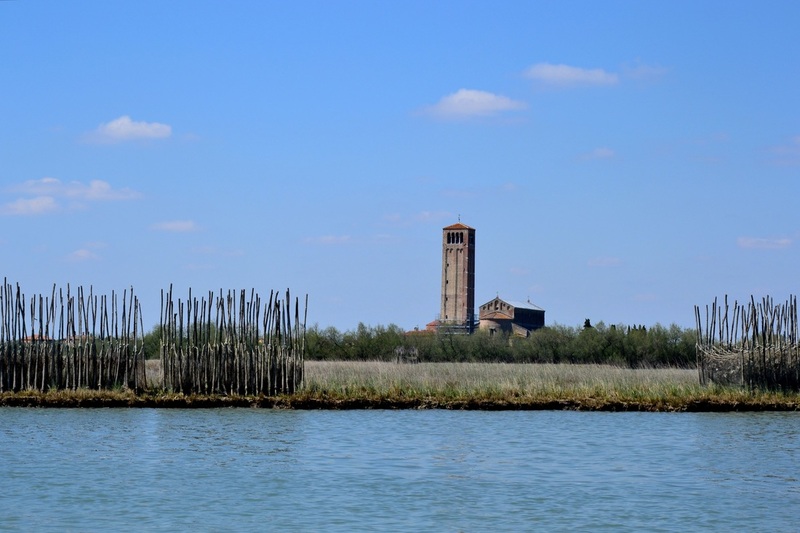 Today, a visit to Torcello is a relaxing adventure in the northern lagoon. You'll see most of the northern lagoon during the boat ride there, and disembark at a lovely rural outpost. Even without visiting the church, a visit to Torcello can feel like a vacation from your vacation! Only one boat stop from Venice lies the Island of La Certosa, a long a abandoned island that is currently being restored as a nature preserve and recreation center. Here there are virtually no signs of the "tourist" Venice. Rather you will find several kilometers of docks in a long marina, nature trails through fields and trees and, perhaps have the chance to go clam-digging at low tide with stunning views of the Lido. Though there is a small hotel with a cafe and a yacht club on the island, you will not find much else by way of amenities. This is a place to enjoy nature in the lagoon! Work on restoring the island is ongoing, however, exploring the parts that are open provides a unique opportunity to experience the natural environment of Venice. Only a five minute boat ride from San Marco or a two minute ride from Zattere, La Giudecca can offer you all the views and sightseeing you need without the crushing crowds of the main island of Venice. This small island is staunchly Venetian, with an enduring small-town feel, and full of delights and surprises. Look for yacht harbors, small locally owned food shops and wonderful homey restaurants and take a stroll along the Rio del Ponte Longo to catch a glimpse of a Vaporetto that has been converted into a houseboat. How to Get There: You can reach La Giudecca very quickly by boat from either San Marco or Zattere. Mix a visit to the Venice of Venetians into your sightseeing by walking to L'Isola di San Pietro di Castello. The site itself is of great historical significance, the seat of the Bishop of Venice, and the route will take you down the Via Garibaldi through the Castello district where tourists are few and local life bustles. How to Get There: To get to L'Isola di San Pietro di Castello walk down the Via Garibaldi through the Castello district. When Via Garibaldi branches off, stay to the right on Fondamenta Sant'Anna. You can continue forward until you cross one long bridge into the Island of San Pietro di Castello. To see more on your walk: Cross the second bridge on your left from Fondamenta Sant'Anna. Continue forward onto Calle Ruga and through Campo di Ruga. Take the last right onto Calle Larga San Pietro. You will be rewarded with a stunning view of the Canale di San Pietro and will enter directly into Campo San Pietro across from the church. There are many small public parks in Venice, but Parco dell Rimembranze at Sant'Elena offers the largest and easiest to get to green space on the main island of Venice. If a little peace and quiet and the smell of grass is what you crave Sant'Elena is the place to go. The position of Sant'Elena, on the far eastern tip of the island between Venice and Lido also makes it a perfect vantage point from which to watch a regatta. How to Get There: Sant'Elena is at the far eastern end of the main island of Venice. It is possible to walk the entire distance from San Marco to Sant'Elena on the wide Fondamenta along the Canale di San Marco. 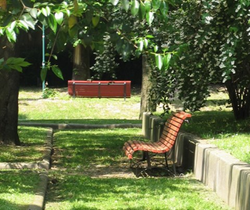 But, if you prefer to save your energy for walking in the neighborhood, take the Vaporetto to the Sant'Elena stop.